Gifts are everyone's favourite and everyone loves to have gifts. This gift hamperis more precious for your loved ones because it has yours love. 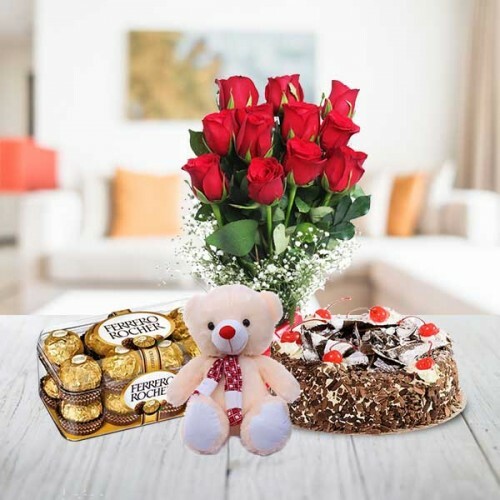 If you are searching for a gift for your friend through online, then you can go for this hamper. By gifting teddy bear to your Loved ones on their birthday you can make your relation strong. Teddy bear are gifts of those types which get together with your love for a long-time period. So, this gift hamper is perfect not only for your girlfriends but also for your younger ones. Content: 12 Beautiful roses, teddy bear, 16 pieces of Ferrero Rocher’s & half Kg cake. Teddy:1ft teddy (you can also increase the size of the teddy as per your requirements). It’s a perfect gift for your kid. You can gift this chocolate hamper to your wife on her Birthday or valentine’s day. Keep Out of reach of children less than 2yrs. Guarantees may not apply for timings like Diwali, Eid, Raksha Bandhan etc. You can increase the number of flowers or weight and size of cake as per your need.